Exenia always keeps up with the latest lighting technologies in order to meet the various needs of its customers. For this reason, we are pleased to make the VIVID series available, the latest generation of LED chip on board. 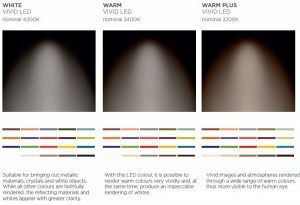 This version of LED allows the viewer to distinguish a wider range of colours, compared to traditional light sources, rendering colours and textures even more vivid. It is easy to imagine the great interest it may arouse for commercial and decorative uses. The colour seen seems more saturated but actually there is a greater perception of the range of visible colours, making the image more pleasant and defined. So far, the evaluation of colour rendering by light sources has been entrusted to CRI (Colour Rendering Index), inadequate for describing rendering by solid-state sources. This makes a real assessment of LED technology and comparison with traditional light sources impossible. The evaluation is based on the measurement of differences between the colour rendered by the measured source and a sample source, within a range of 8+6 predefined colours on linear coordinates (CIE1931). 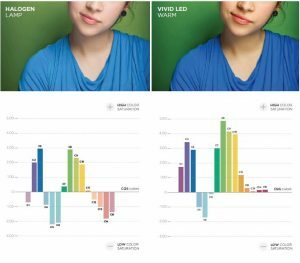 Any change in hue, saturation and luminance results in a reduction in CRI. Although not universally recognised yet, the CQS (Colour Quality Scale) method is catching on, as promoted by NIST, a US government agency dealing with standards and technology. Today, it has been adopted by the world’s most prestigious LED manufacturers, being able to best describe the progress made by this solid-state source. The colour space used by CSQ (CIE1976) is based on 15 samples on non-linear coordinates including all perceptible colours. Thus, the deviations measured also consider the direction of these colours, no longer calculated by using a simple arithmetic mean, but by using a quadratic mean. In addition, light sources with different colour temperatures can be measured by introducing a saturation factor that does not penalise (and increase) the deviations of the measured source for positive increments towards saturation. The CQS samples are more evenly distributed and saturated compared to the CRI samples which are uneven in their distribution.